The continued secondary growth of vascular cylinder in many older roots and stems exerts a pressure which results in the stretching and rupturing of the epidermis, cortex and other tissues outside the secondary phloem. To avoid such breaking of external tissues, the plant organs develop a secondary protective covering by replacing epidermis and other external tissues. This protective secondary covering (tissues) of certain plants, especially woody plants, is called Periderm. The term periderm etymologically means “about, around” (from the Greek perí) and “skin” (from the Greek dérma). Thus, it generally pertains to an outer protective layer. The periderm mostly develops in roots and stems of woody dicotyledons. It does not develop in leaves and monocots (except a few like Dracaena, Yucca etc.). 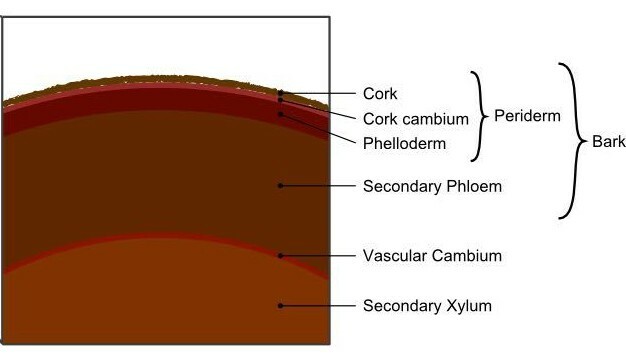 The Periderm consists of following three parts: Phellogen (Cork Cambium), Phellem (Cork) and Phelloderm (Secondary Cortex). The phellogen is a secondary meristem that arises from living permanent cells and is also called as cork cambium. The cell of phellogen appears almost rectangular and radially flattened in transverse section. They are vacuolated, thin-walled living cells with granular contents and divide by periclinal divisions to give rise to the cells of cork (phellem) towards the outer side and phelloderm (parenchymatous secondary cortex) towards inner side. The phellogen always remains single layered. These cells may sometimes divide by anticlinal divisions in order to increase in circumference. The cells that cut off towards outer side from the phellogen differentiate into phellem (cork). The cork (phellem) cells replace the epidermis in roots and stems of certain plants. As they mature, they elongate tangentially and radially and develop secondary wall due to deposition of suberin over the primary wall of cellulose and become dead due to loss of living protoplasm. The lumina of cork cells usually contain resinous or tanniniferous material which gives brown or yellow color to the cell walls. The cells cut off towards the inner side from the phellogen may also divide once or twice again and finally differentiate to phelloderm (secondary cortex). The cells of phelloderm are thin-walled, contain living protoplasm and resemble the parenchymatous cells of the primary cortex. They are not suberized as opposed to cork cells that are impregnated with suberin. In some angiosperms, the cells develop chloroplasts and perform photosynthesis. Moreover, depending on the plant species, the phelloderm may be a single layer or multilayer of cells. Also Read: How do Auxins affect Plant growth? It is more resistant to mechanical injuries and more efficient at preventing water loss. It is because of the cork cells located at the outermost. They are impermeable to water and therefore, protects the loss of water. Apart from the cork cells, the cork cambium is a type of meristematic tissue in many vascular plants. It is, in particular, a lateral meristem, and provides new cells that form the inner layer of the periderm, phelloderm. It is also responsible for the formation of cork or phellem in woody trees and certain herbaceous plants. Within the periderm are lenticels, which form during the production of the first periderm layer. Since there are living cells within the cambium layers that need to exchange gases during metabolism, these lenticels, because they have numerous intercellular spaces, allow gaseous exchange with the outside atmosphere. Also Read: What are Antitranspirants? How do they Reduce Water Loss in Plants? Next PostWhat are Swim Bladders?